Lake Town Animal Hospital | Veterinary Services located in Chapin, Ballentine and Lake Murray, SC! Lake Town Animal Hospital was founded to provide exceptional medical and surgical care to pets in the Greater Chapin area. We strive for excellence in all that we do, and are committed to caring for your pet as our own. For us, it’s not just about veterinary care; it’s about connecting with our clients and our community in a way that serves them, their fur family, and the profession we are privileged to be a part of. We are dedicated to you and to ensuring a long, healthy life for your pet. We welcome you to the Lake Town Animal Hospital Family! The Fear Free approach to veterinary care was created to alleviate fear, anxiety and stress in pets and educate and inspire the people that care for them. 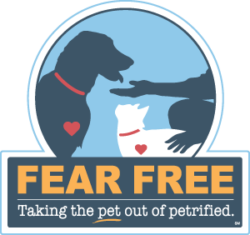 Fear Free focuses on both the physical and emotional well-being of your pet, and aims to take the ‘pet’ out of petrified. At Lake Town Animal Hospital, we are committed to this elevated standard of care, and are confident you and your pet will see and feel the difference each time you visit our hospital. Our website is a Work-in-progress. Please visit us for updates! Copyright © 2018 Lake Town Animal Hospital. All rights reserved. Site designed and maintained by Beks Graphics.